Your third molars, commonly known as wisdom teeth, usually show up in your teens or early twenties. Located in the far corners of the mouth, wisdom teeth have a reputation for causing trouble. If they are healthy and erupt properly, no action is needed. However, wisdom teeth often come in sideways and crowd other teeth, or they get stuck or impacted inside the jaw and cannot fully erupt. This can lead to symptoms like swelling, gum pain, infection, tooth decay, and even formation of cysts in the jaw. Surgical wisdom tooth extraction is often necessary to resolve or prevent these problems. Wisdom Tooth Removal Procedure –A surgical wisdom tooth extraction can generally be performed in a dentist’s or oral surgeon’s office. In complicated cases, it may require hospitalization. Before your surgeon begins, the incision area will be numbed with anesthetic, so you won’t feel any pain. 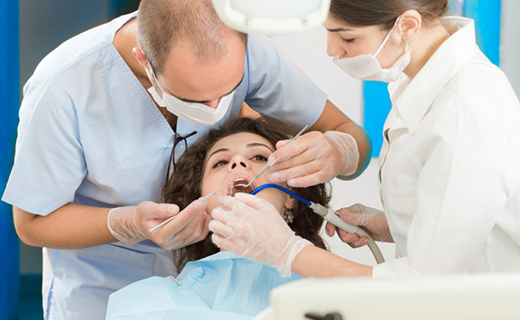 If you’re having multiple teeth removed, you may receive general anesthesia instead. To remove the tooth, the surgeon will make an incision over the gum tissue that covers it. If the tooth is difficult to extract, it may be cut into several pieces before it is removed. Stitches will be used to close the incision if necessary. Wisdom Tooth Extraction After-Care – Recovering from wisdom teeth removal generally takes several days, so take it easy for a day or so after your surgery. You will receive prescription medication to control pain if needed. To help reduce post-surgical bleeding, bite gently on a piece of gauze. If you still have significant bleeding after 24 hours, inform your dentist or surgeon. While your mouth is still numb from the anesthetic, be careful to avoid biting your lips, tongue, or inner cheek. Activity can increase pain and bleeding. Eat soft foods like pudding or soup while you recover. Add solid foods as you can tolerate them. Do not smoke or use a straw for at least 24 hours after surgery. Possible long-term complications of wisdom tooth extraction include jaw pain, damage to existing dental work, and extended or permanent numbness in the mouth or lips. Report any unusual symptoms to your dentist or surgeon promptly. To get the dental care you deserve from an affordable dentist in Atlanta, call today at or make an appointment. Dental One Associates offers affordable family dentistry and gentle, compassionate dental care in Atlanta. With 8 affiliated practices throughout Georgia, our offices are conveniently located with extended hours to meet your needs. At , we provide most dental services, from basic preventative care and general dentistry to specialized procedures and complete dental reconstruction. We accept most dental insurance plans and offer affordable financial solutions for any budget. Patient satisfaction is our top priority and we strive to provide the exceptional, affordable dental care and personal touch that lead to lasting relationships. A smiling patient is our greatest reward and we look forward to keeping those smiles healthy, beautiful, and bright. Discover an affordable dentist who truly cares at .